Bassist Robb Fisher has been a sideman for a diverse number of artists since moving to the Bay Area in l967. Born in Los Angeles, California, on January 6, 1946, Robb was fortunate to be around jazz because his father was a bassist and arranger, who had an enormous record collection. (His dad later became the first person to ever receive a Master’s Degree in jazz at USC.) Robb studied clarinet and alto sax through junior high. In high school, a love of jazz and collecting LPs engulfed him. “I started to sneak into Shelly’s Manhole on Monday nights to listen to the Mike Melvoin trio. I was mesmerized,” Robb says, “by Leroy Vinnegar’s inspiring, walking bass. I knew that’s what I wanted to do.” Robb’s dad, who was a full-time professor of music and not playing much, let him have his bass so he could study classical bass with Al Pollan, a studio musician in Hollywood, for four years while attending the University of Redlands. 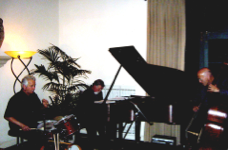 During college, Robb formed a piano trio with John Prince. “We copied tunes that we heard on Les McCann records,” Robb says. 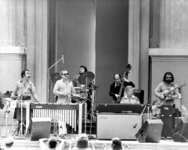 In 1976, Robb joined Cal Tjader’s group, which included percussionist Pancho Sanchez. It was an association that lasted over six years and a key highlight in Robb’s career. “Cal was a mentor to all his sidemen,” say Robb, “and his lyrical ballads and love of Afro Cuban rhythms was impressive. Cal was a master of breathing. It was as if he could light up a cigarette while he soloed.” Robb toured and recorded many albums, including anchoring Cal’s Grammy Award winning album, “La Onda Va Bien” and Grammy Nominee album, “Gozame Pero Ya.” During this period, Robb recorded with such jazz and Latin luminaries as Art Pepper, Carmen McCrae, Clare Fische, Tania Maria and Anita O’Day. Cal died on Cinco de Mayo in the Philippines in 1982. “It was a significant loss for all of us,” Robb says. For the past years, Robb has continued to play with a wide range of local Bay Area jazz musicians, including Akira Tana, Eddie Marshall, Peter Horvath, Vince Lateano, Mark Levine, Matt Clark, Brian Cooke, Susan Muscarella and Rob Schneiderman. 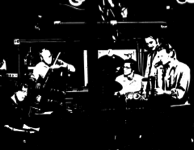 In the 90’s, Robb and guitarist George Cotsirilos formed a quintet that featured drummer Eddie Marshall, a creative vehicle for original works to be played. Two of Robb’s tunes can be heard on the Monarch recording entitled “The Nighthawks featuring Eddie Marshall.” He is currently playing with the highly respected Mel Martin’s group, “Bebop and Beyond.” Robb also teaches at the Jazz School in Berkeley and Bob Athayde’s Lafayette Summer Music Jazz Workshop.